Book at least 45 days prior to arrival to save 25% for stays between 1 November - 26 December 2018 and 22 April - 26 December 2019. Book at least 60 days prior to arrival to save 25% for stays between 27 December 2018 - 21 March 2019 and 27 December 2019 - 31 March 2020. Not valid for stays in Overwater Pool Villas. Book at least 45 days prior to arrival to receive a free upgrade from full board to all-inclusive or from all-inclusive to all-inclusive plus for stays between 1 November - 26 December 2018 and 22 April - 26 December 2019. Book at least 60 days prior to arrival to receive a free upgrade from full board to all-inclusive or from all-inclusive to all-inclusive plus for stays between 9 January - 21 April 2019 and 9 January - 31 March 2020. 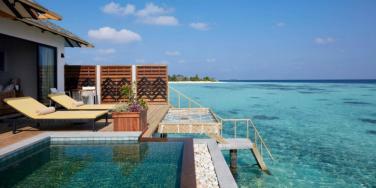 7 night minimum stay applies, not valid for stays in Overwater Pool Villas. Combinable with early booking discount. Honeymooners receive a romantic villa set up and one bottle of sparkling wine. Honeymooners staying at least 7 nights also receive a romantic candlelit barbeque dinner on the beach including sparkling wine.